If you're on a budget, hiring an experienced DJ who uses high quality, backed-up equipment without breaking the bank is vital. 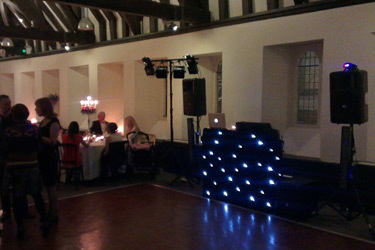 DJ Hire Bristol's costs are quoted in full - no hidden extras or surprises. Remember - you will get what you pay for. DJ Big Chris played at my wedding and I must say it exceeded my expectations! Even the shyest of guests got up and danced, and the dance floor was packed with all ages, from two year olds to 72 year olds! We had a blast and I will definitely be in contact again for the next event, as well as highly recomend him for anyone who wants their wedding disco to be fun and memorable. To Chris, thank you! Before our party you listened patiently to my needless flustering about genres (needless because balancing the music to the audience is clearly your thing). And on the night you delivered the great tunes with quality sound. Loads of people have said how good the music was. 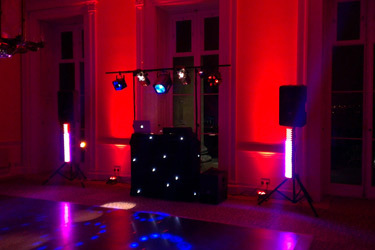 * A typical Wedding/Civil partnership disco setup featuring; up to eight lighting effects, 2 lasers, star cloth, full DJ stand, speakers and a bass bin. * A typical Party and birthday disco setup featuring; up to six lighting effects, laser, star cloth, DJ stand, speakers and a bass bin. *Please note, exact equipment may vary depending upon availability.